Come play music written by kings and clowns, Ladies and lawyers, dance masters, doctors, and troubadours. Welcome to the Middle Ages and Renaissance. Creativity flourished throughout the times that produced writers, Artists, and scientists such as Dante, Chaucer, Shakespeare, Michelangelo, da Vinci, and Galileo. 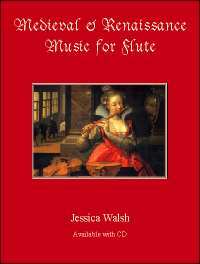 That inventiveness is evident in the imaginative and eloquent music in this collection. Among the melodies are a Portuguese troubadour’s “Song for a Friend” written almost 800 years ago, John Dowland’s “Midnight”, silenced from the mid-1600's until the discovery of Margaret Board’s Lute Book in 1970, and a beautiful and haunting song written by a Scottish Lady. There are over 40 tunes in this beautiful collection. Also included is a digitally mastered audio CD featuring the songs contained in the book.